The 11 ft. Road Groom has 8 blades totaling 31 feet. It cuts, fills, and spreads in one fast, easy operation. 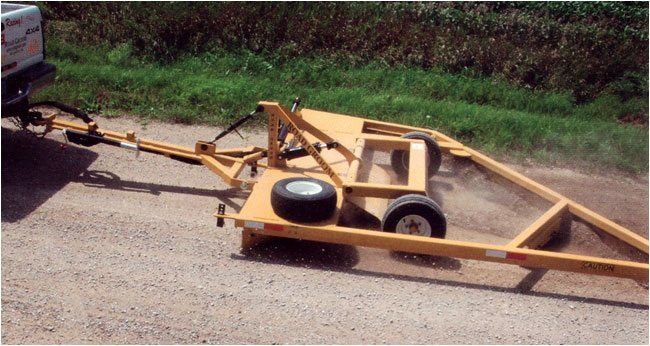 At approximately 2,280 lbs the Road Groom can be pulled by a pickup, tractor or dump truck, with grading speeds around 20 mph. 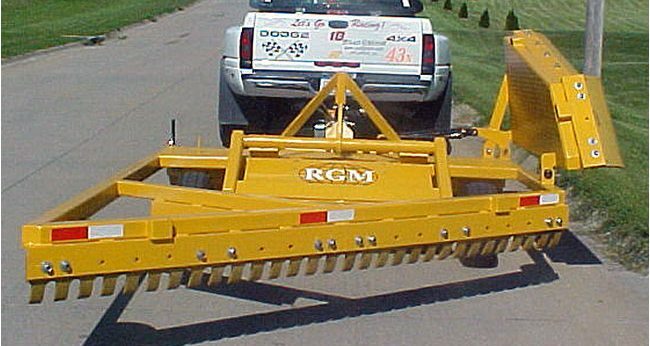 For more information about our road grooms and how our clients are using them for simple road grading, we invite you to view our brochure or read more about its use bettering Oklahoma roads. We’ve had our Road Groom about two years and pull it with a pickup.The first time it was used, I took it out myself and did over 100 lane miles in one day. Try that with a Blade. We have used the Road Groom for about three years now and are very happy with the job they do for us and the savings they give us. We have some very low traffic roads that haven’t had any grading in over two years and the Road Groom roads are the smoothest. Gravel and fuel savings with the Road Groom have been better than we could have ever hoped for. We now have three machines. This machine works great for me. I keep all my roads in better shape than ever before and do it myself and don’t have to hire a blade. We have had our Road Groom for over two years and use it a lot. It is by far the most economical and fastest way to keep roads in excellent shape. As our county budget gets tighter, we have had to get more done, with less labor. Road Groom has been the answer for us. We not only do a better job of grading and removing washboards, we also get it done faster and with less money. The Road Groom works great on my gravel roads. We are high on the job the machines are doing, and the good public relations created by well maintained roads. Swihart Sales Company offers a great selection of road grooms that assist in road maintenance and agricultural needs throughout the country.